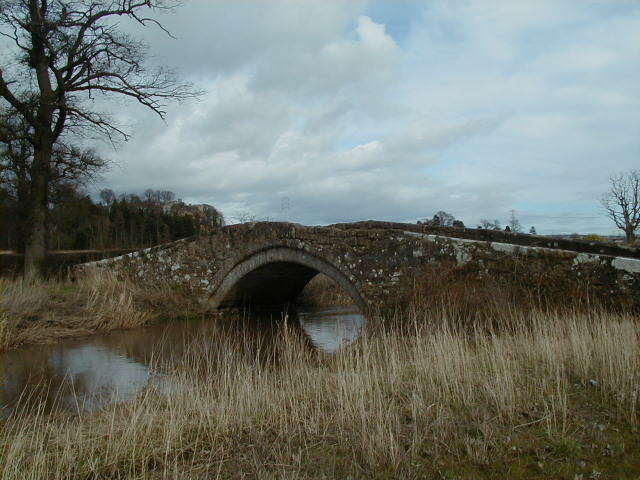 Abbeytown Bridge can be found where the old road from Falkirk to Airth crosses the Pow Burn to the south west of Airth castle. The bridge was so named from the fact that the possession of rights of the properties and lands of Airth were granted to Holyrood Abbey and the village of Airth began to be known as the Abbeytown of Airth. FOUNDED UPON WOOD AND / REBUILT BY THE / SHIRE 1726. There was a well near the Abbeytown Bridge, called Lady-well, which was not, as was at one time thought, medicinal. The idea that it may have been medicinal seems to have come about due to the fact that the holy water used at the Old Parish Church in its early years, which of course was at that time catholic, was taken from Lady-well. Unfortunately this well was distroyed during open cast mining that was carried out in the area. There has recently been set up a walkway that passes along the bottom of the hill that supports both Airth Castle and The Old Parish Church. If you take this walkway you will be able to see the Wallace and Bruce towers of Airth Castle at their best. When you come to the end of the walkway, if you turn left you will come to Abbeytown Bridge. click here to go to Airth Castle page click here to go to The Pineapple page. click here to return to the front page. click here to go to to The Mercat Cross page.